Casey Rhode may not want to be remembered for his academic accomplishments, but given his record of achievement, that may be inevitable. Named to the "2017 Best & Brightest" list by Poets and Quants, Rhode was asked what he hopes his business school peers will say about him after graduation. "I don’t want to be remembered for my academic or professional accomplishments," he responded. "I want to be remembered for my personality and the way I treated people." 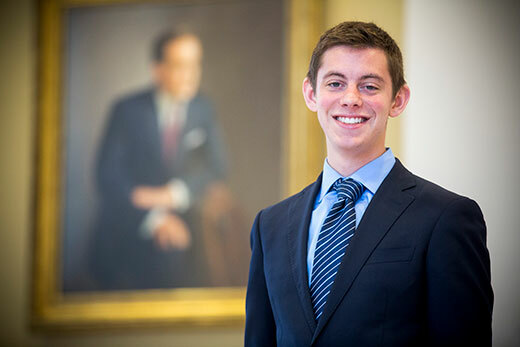 Yet both his accomplishments and his personality will leave quite an impact on Emory's Goizueta Business School, where he is graduating with a 4.0 grade point average while finishing concentrations in finance, strategy and accounting. In addition, Rhode serves as CEO of the Emory Impact Investing Group (EIIG), a student organization dedicated to improving economic vitality in Atlanta by providing low-interest loans to entrepreneurs from economically underserved areas without access to capital. An avid runner, he is also a member of Emory's varsity cross country and track and field teams. There is a correlation between running and earning a 4.0 in the classroom, Rhode says, even though he didn’t set out to achieve the high marks. "In running, you are essentially competing against your own limits and your personal bests, rather than other people,” he explains. "This is especially true in my case because I am not one of our top runners. This transfers to the classroom, because I am striving to do as well as I possibly can, regardless of my grades or how my classmates perform. Running helped shape his personality and taught him to focus on process-oriented versus outcome-oriented goals. "Rather than worry about an end result which may not be entirely controllable, I now emphasize working hard and doing all of the little things within my power, trusting that a good outcome will follow," he says. "This mindset increases motivation and reduces stress and uncertainty. It is something I bring both to the classroom and to my work, and has been very beneficial to me professionally." A native of Blue Bell, Pennsylvania, Rhode brought his business talents to his role as CEO of EIIG, helping the organization raise $30,000 and make loans to three entrepreneurs around Atlanta. Rhode says he was impressed by the way these entrepreneurs faced their challenges, particularly those in underserved communities. "The grit and determination of these individuals has inspired me,” he says. "Beyond that, leading the group has helped me grow as a person. Being so passionate about this cause, I learned to sacrifice my own self-interest for the good of the organization." By studying business at Goizueta, Rhode said he learned the value of integrity, building relationships and learning from experience, personally or from peers. After graduation, Rhode plans to work at Perella Weinberg Partners as an investment banking analyst, building on the experience he gained over two summers as an intern for the firm.